Smith & Wesson Tactical Pen & Stylus Black | BUDK.com - Knives & Swords At The Lowest Prices! 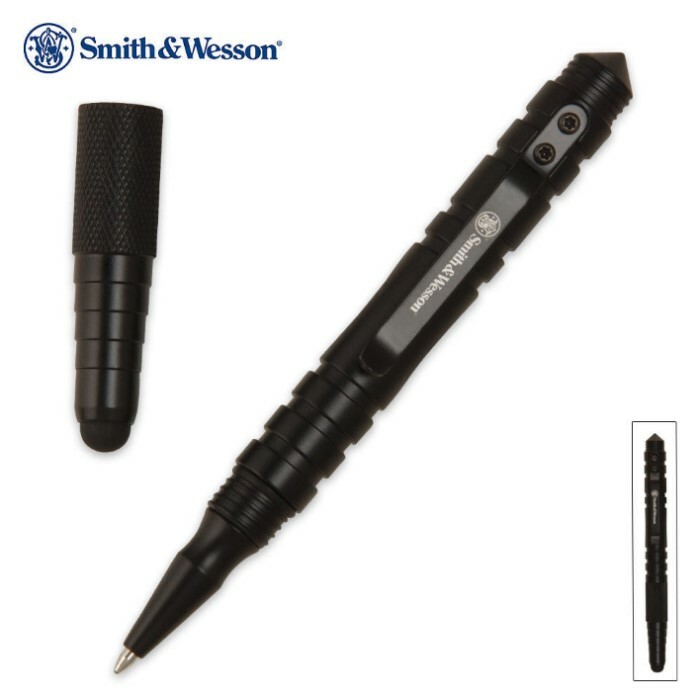 The Smith & Wesson Black Tactical Pen and Stylus, model SWPEN3BK, is the third generation model of this series. This tool features a soft tip that works perfect as a stylus for all your electronic devices. The cap screws on and off for access to the pen and the cap can be screwed on the back end for easy storage while writing. The end of the pen is pointed and can be used as a self defense tool should the need arise. The pen writes in black and uses a Schmidt P900M Parker style black ball point pen refill. I have wanted one of these for a long time. I finally pulled the trigger on one about a month ago. The pen is solid and of sturdy construction. The stylus tip wore out pretty quickly and is no longer really usable. Overall this thing is pretty neat. I like like one bad @$$ IT guy when i whip it out....lol.